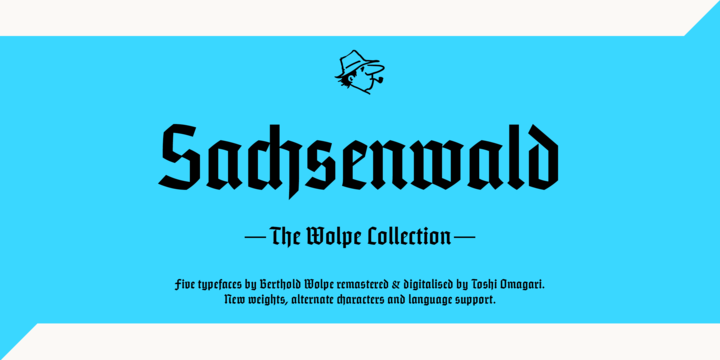 Sachsenwald is a typeface created by Toshi Omagari together with Berthlod Wolpe and published by Monotype which was designed to be suitable for headline, branding, movies, video-games etc. This versatile font is available in 2 weights (Regural & Light), alternate character and language support. Have fun! Note: ”Sachsenwald” is a trademark of Monotype Imaging Inc. and may be registered in certain jurisdictions. A font description published on Monday, October 2nd, 2017 in Berthlod Wolpe, Fonts, Monotype, Toshi Omagari by Alexandra that has 2,133 views.